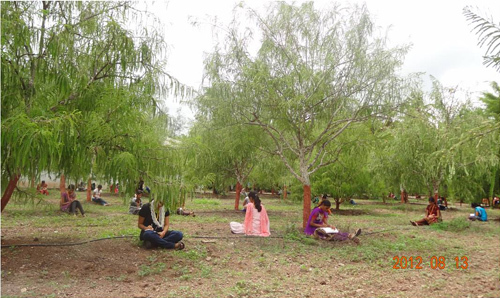 The Initiatives of Change, Let's Make A Difference, Baramati Residential Youth Conference was held from 11 to 14 August, 2012 at the Agricultural Development Trust, Shardanagar. 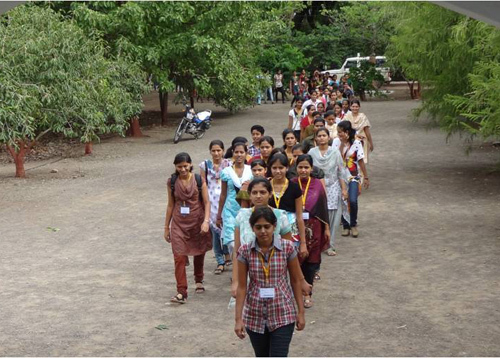 333 youth from and Baramati and its surrounding areas participated for this conference. Shri. Rajendra Pawar, President of the Agricultural Development Trust, Shardanagar, inaugurated the conference. 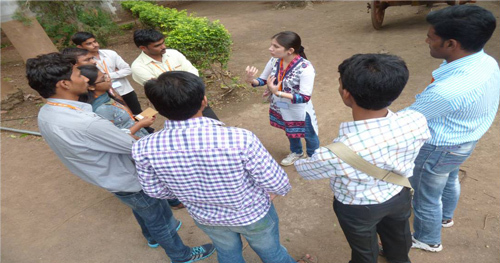 IofC – LMAD needs to visit them regularly, inspire them, motivate them and let them know that you are no less and capable in comparison with any other urban youth across the country. If we can instill self belief in them that they are world class material, we are convinced rural India will be far ahead than the concrete jungle and will provide alternate in thinking. The superiority complex the urban youth carries only comes from good dressing and groomed personality, better control over the language and over all exposure to be in connected with the urban world. But when you think deeply, the qualities displayed by many urban youth is cosmetic, the real content is whether village or city is good moral and ethical foundation, and what we derive out of our experience is that the rural youth is open to good invasion, they are willing to surrender to better guidance which will groom them to become a better human being. Throughout the Conference, discipline and punctuality was maintained by itself and the participants were seated much before time in the most receptive manner. The introduction of the absolute values of honesty, purity, unselfishness and love in a manner of learning with examples intrigued them and the participants felt connected to the values, though these values are been spoken endlessly in the homes, education place, society and many forums but still for many its application becomes a question, and if applied it is for convenience. LMAD team was able to explain the relevance of values in one’s life and how easily one succumbs to pressure and that result into short cut for building ones life’s foundation. With short cut one can only derive momentarily pleasure, life built on hard work and perseverance can last till the very end of one’s existence. All through the life one only has to build foundation which exist deep within and not visible outside, but the person standing on a strong foundation displays rare quality which automatically attracts people’s attention and also a character which is rare in today’s time. Endless vulnerable moments will cross ones existence but what is important is to stand by what one believes in. Several times the situation will make us vulnerable and we think to compromise, when such situation arises one has to depend on the positive peer group which has been built through such Youth Conferences. In this Conference, many youth interact with others who believes in no compromise, such people strengthen our ability and gives us courage to face the storm and once faced the effect is soothing, calm and it leaves behind a strong conviction that I can do it, so subscribe to hard work, relentless efforts and no short cut. Try it; it works and if what we have taught does not convince you after a while one is always free to go back to what one wants to do. Sharing examples of ethical living made the younger generation believe that they can do it and it is possible in today’s time to live ethically and morally all that one needs is inner conviction and self belief that I can do it. Karan Khalate, the youth representative of Let's Make A Difference, Baramati, spoke about his journey with Initiatives of Change since 2011. He shared about how his inner voice guided him to follow the path of Honesty, Purity, Unselfishness and Love, and yet helped him to win the elections and be a member of the Zilla Parishad. He also shared that these principles play a very important role while he is serving 25,000 people he is responsible for. The concept of Quiet time was new for these participants and never before they had heard of quiet time and what one has to do in the moments of disciplined quiet time. In the simplest of manner the participants were introduced to the idea of being quiet every day and later on, in daily life for at least 20 minutes one must make a genuine attempt to remain quiet everyday and seek inspiration from within. The disciplined part is most important, the way we are been living our life everyday and has a set routine and most of things in routine falls in its place in a similar manner quiet time has to become an integral part of one’s living and when disciplined one will start experiencing the magic of quiet moments and what these quiet moments can show and guide an individual from within. For three days during this conference, participants spent several long hours every morning in being quiet, which gave them a glimpse of inside peace and made every participant write and express what their conscience was telling them. “It is very important to be honest with ourselves, with our family and our society. I started applying this principle, and I experienced change. I learned that jealousy and selfishness only creates distances between loved ones. Quiet Time has played a major role in making me realize that my parents have struggled to fulfill by basic needs, and that it is my sole responsibility to make the best out of me as a son, as a human. One must keep themselves and their surroundings clean and pure, so that it reflects in their thoughts, deeds and speech. A young boy mentioned that he practiced Quiet Time and self-introspection for the first time. He learned about himself, that he was a pessimist. Whatever thoughts came into his mind were mostly negative. He realized how bad as a person he was, and he also thought that he must take responsibility for his parents. Another participant shared said that he lost his best friend because of jealousy, and that he wanted to overcome that feeling. There was a dedicated session focused on how to think deep about one’s life and clean oneself from within. Along with outer purity, it is necessary to be pure from within, and to have clear conscience. One must be careful and aware at each step in life. Quiet Time must be used as an important tool. ”It is important to have goals in one’s life, and one must strive to reach that goal. One must not walk on a path that has shortcuts, but one must work hard. Along with hard work, it is important to remember, in each step, one must not forget their values. Work is God; walk on the path of PHUL (Purity, Honesty, Unselfishness and Love)”. Young people lack focus in life and when they were challenged to measure their life by what they want to achieve they were in a maze situation, they do not see much clarity, through one of the exercise they were made to think what are the most important aspects in one’s life and what one needs to do to is achieve it and sustain it for life. Have goals which will challenge us to get up and perform. This in depth exercise helped each one of them to identify their relevant goals and how to create a road map to achieve them, where the path is ethical & moral, where guidance received is through inner voice. Towards the end of youth conference, all the participants gathered for the multi faith prayer which sounded like unison, God’s and Saints of all religions were glorified and in one voice all were praising Lord. It gave us a feeling what true India stands for and why this nation is remembered for its glorious oneness and in real sense the auditorium sounded as if we all belong to each other. We all are one. During the Open Forum, in which all the participants gave their personal feedback as well how they would live life differently, the Guest of Honor, for the concluding day, Mrs. Sunanda tai Pawar (Trustee of Sharadabai Pawar College of Education for Women) echoed what was been spoken during the course of the conference, her inspiring speech gave clear guidance and road map to follow for the youth to walk on the path of righteousness. Check out more pictures at IofC - Lmad Facebook Page.